Abstract The Coastal Conservation and Education Foundation, Inc. has encouraged the development of effective MPA networks in all its target areas. The starting point has been social, institutional and learning networks among municipal governments. As these networks gained strength and confidence in their inter-municipal coordination efforts, they will move towards looking at habitat conditions and representativeness, fish abundance, and other aspects of connectivity. Thus, an enabling condition is set for them to eventually become an ecological network of MPAs. 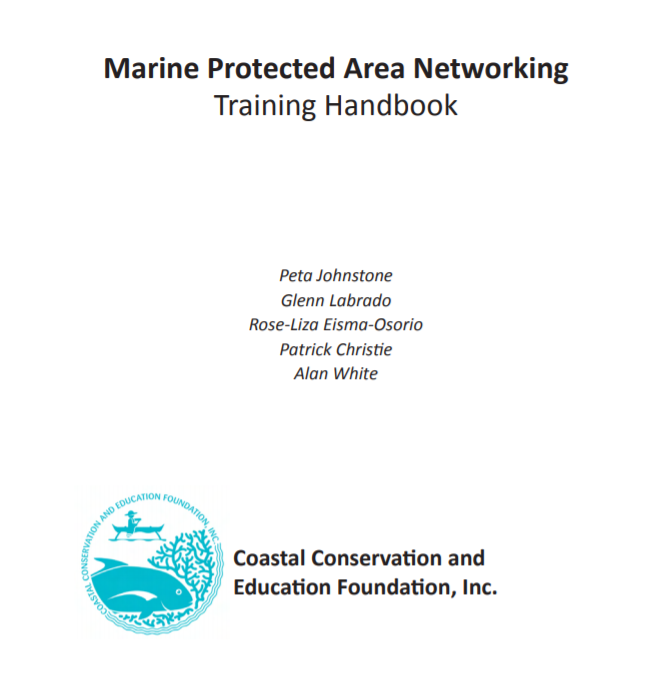 With this MPA Networking Training Handbook, municipal governments and supporting institutions are encouraged to work towards ecological, social and institutional networks of MPAs. The concepts, principles, and case study provided in this handbook can provide a practical guide for a broader inter-municipal collaboration framework at the ecosystem scale. Ultimately, the road leading towards MPA networking is very long. But we must keep in mind our ultimate goal, which is to have a more productive fishery for the benefit of all stakeholders.